A pair of diametrically-opposite housing bills City Council is considering this session really starkly highlight the confused thinking about the topic of housing affordability that prevails in Council, and what we might do differently if we really cared about providing a range of housing choices at different price points. Council is declaring housing affordability a major problem they're concerned about and they've unveiled a 'Putting Philadelphians First' package of bills to address the issue. The package contains mostly sensible ideas, including a 1% tax on construction projects to finance below-market-rate housing, the creation of a new sub-fund within the Housing Trust Fund, and a revamp of the density bonuses for inclusionary zoning. This is a reasonable framework for boosting local funding for below-market-rate housing, but the bigger issue continues to be that Council has no plan whatsoever for making market-rate housing more affordable. It often seems like "market-rate housing" is used rhetorically as a synonym for "expensive housing" but there's no reason why this needs to be the case. In fact, Council's inclination to give up on the whole idea of trying to keep the market rate itself affordable for the middle class is exactly what is going to send us down the path to a real housing crisis, since the overwhelming majority of residents are always going to be shopping for housing in the market-rate part of the housing market. The tools exist at Councilmembers' disposal—right here at the local level—to increase the availability of lower-cost market-rate housing options. But unfortunately, at almost every turn, Council's default inclination has been to use these same tools to stifle the proliferation of less costly housing choices. This is how we ended up in the insane situation where, in the very same week, Council was scheduled to debate both the affordable housing package mentioned above and a bill (No. 160710) that would increase housing costs by doubling off-street parking requirements for residential construction. The evidence on this is not controversial or disputed. 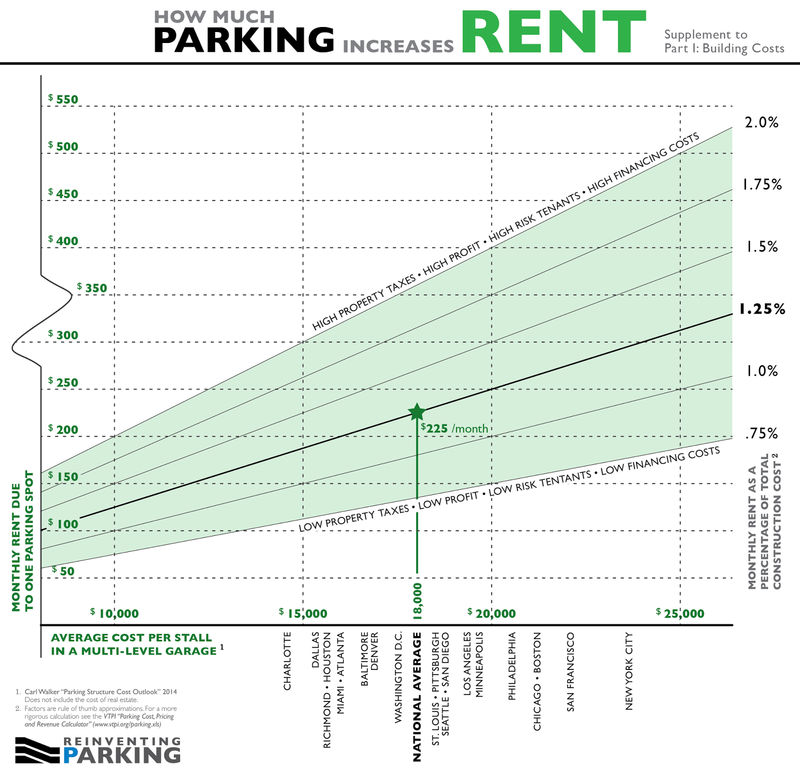 Parking requirements increase housing prices. Local research conducted for real estate company Houwzer by economist Kevin Gillen found that a single parking space added to a home within a mile of City Hall adds about $60,000 to the price tag. Citywide, adding a single parking space adds between $18,000-28,000 to the cost of a home, on average, or about $150-400 per month in rent. So to recap: at the same time as Council is considering actions to create some more inexpensive housing, they're also considering actions that would substantially drive up the average cost of housing. These issues are interconnected. There are lots of people who are currently struggling to afford their market-rate housing who could end up needing housing assistance subsidies if the prices keep going up. Similarly, there are people who are just on the cusp of being able to afford market-rate housing who might not need public assistance if more naturally-affordable housing options became available. Local housing policy thinking should be absolutely obsessed with the people right around that cusp, because what happens to them is going to determine how much additional money we need to raise to fund below-market-rate housing. The more people who can afford housing without additional public assistance, the more money there will be to go around for truly low-income people who are unlikely to ever be able to afford any kind of market-rate housing, no matter how inexpensive. What would a Council that wanted to use their power to lower market-rate housing costs be doing instead? They would start by unbundling parking costs from housing costs so that it's possible for people to buy or rent only a house, without also being forced to pay for unwanted parking spaces. Rather than doubling parking minimums, we should zero them out wherever they still exist in the zoning code. Council should also halt their downzoning spree, and stop deleting all the RM-1 apartment zoning from neighborhoods when they do zoning remapping. As one Francisville resident argued in today's Council hearing on a controversial bill to downzone that neighborhood, duplexes and triplexes and other naturally-affordable "missing middle" options would also be swept aside in the mania for single-family zoning. Councilmembers could also choose to make a bedroom—rather than an entire housing unit—the basic unit of housing in Philadelphia, by legalizing rooming houses as L+I head Dave Perri has advocated. As Diana Lind wrote recently in an op-ed calling for the legalization and regulation of rooming houses, "The single-family residence is often the only kind of housing that can be built or permitted in most American residential communities. It’s also the most expensive kind of housing that has ever existed." While it's true that new housing is generally going to be more expensive than older housing, multi-family housing as a category is always going to be cheaper per capita than single-family housing because the land costs are shared between multiple households rather than borne individually. The bottom line is that the market rate for housing is partly a function of local public policy, and the policies Council has been pushing are bad for affordability on net. Legalizing housing that doesn't have parking bundled in, and allowing more communal housing types on shared land is how we can fix the housing market for the middle class. MBA: Parking Reform from STREETFILMS on Vimeo.